My daughter Molly’s summer is a bit different this year: she’s working on the Topsy Turvy Bus. You’re probably saying “huh?” which is what I said, but it’s actually pretty cool. 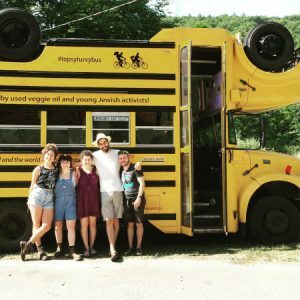 Molly and her colleagues lead fun, educational activities with the campers, and the blogs I’ve read and the videos I’ve watched make it clear that this is a) environmental education with impact and b) conveys the Jewish values that motivate this effort. I invite you to follow the Topsy Turvy Bus’ adventures online throughout the summer. I know I will!